There is just one day left for the multi-starrer film Kalank to hit the big screens. The film starring Varun Dhawan, Alia Bhatt, Aditya Roy Kapur, Sonakshi Sinha, Sanjay Dutt and Madhuri Dixit Nene is a period drama, set in the pre-Independent era. Directed by Abhishek Varman, the film has got 12A certificate by the British Board of Film Classification (BBFC) on April 12, 2019. Not just that, Kalank also got M certificate yesterday (April 15, 2019) by Australian Classification Board. Kalank Song Aira Gaira: Twitterati Call Out Karan Johar for Going Back on His Word to Never Use Item Numbers Again. Kalank is set in the British era and the long-buried secrets gets unfolded when a young man and woman fall in love. 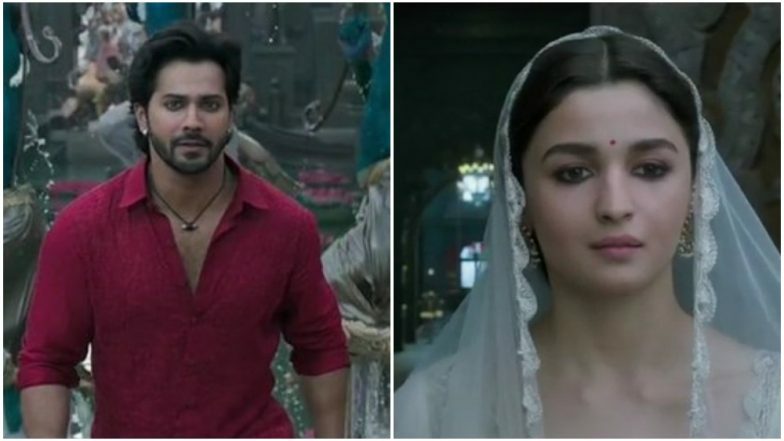 About the censorship of Kalank trade analyst Taran Adarsh tweeted, “#CensorNews: #Kalank certified 12A by British censors on 12 April 2019. Approved run time: 165 min, 34 sec [2 hours, 45 minutes, 34 seconds]. #UK #Kalank certified M by Australian censors on 15 April 2019. Approved run time: 166 min [2 hours, 46 minutes]. #Australia”. ‘Tabaah Ho Gaye’: Twitterati Are Falling Head Over Heels for Madhuri Dixit’s Impressive Dance Performance in Kalank. Be the film’s posters, character posters, teaser, trailer or the songs, everything has turned out to be impressive. The movie fanatics are also looking forward to Sanjay Dutt and Madhuri Dixit Nene’s performance in the film as it is after two decades that the two have come together for a movie. Let’s wait and watch how this multi-starrer manages to rule at the ticket windows. Stay tuned for further updates.